June 2014 Newsletter : LA Weekly Names FormLA Among Top 15 "Most Innovative" Businesses. 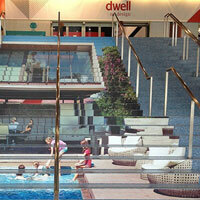 We hope you enjoyed Dwell on Design as much as we did! Thank you to Shades of Green’s Ive Haugland, Mountain State Nursery’s Wendy Proud, and Dwell’s Lynn Cole and Katie Murin for an amazing experience creating Dwell Outdoor. Thank you to those who popped by the booth and came to see our on stage conversations with Dwell’s Will Lamb and Diana Budds – it meant so much to see your faces smiling back at us! Go to Gramas or Bermuda? Shine up hardscapes and ready BBQs! Our fantastic Dwell Outdoor building team. 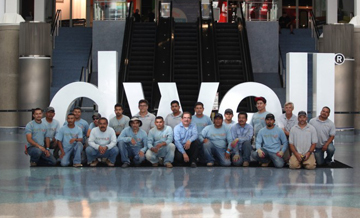 Thank you for the wonderful, hard work, gentlemen! 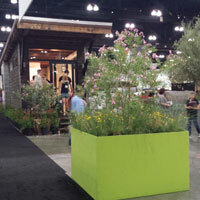 FormLA® Landscaping is transforming Los Angeles, one beautiful, sustainable landscape at a time. Learn more about sustainable landscaping in our Resource Center, see vibrant landscapes in our Project Gallery, or check our Events page to tour our work and meet the FormLA Team. We look forward to connecting with you!